The Comptroller and Auditor General of India’s Delhi unit in its report pointed out various discrepancies in Delhi government’s departments. The reports were tabled before the Assembly today, the last day of the budget session. The modes of transport in Delhi, other than auto, remained packed today with huge rush of people struggling to travel across the Capital following the autorickshaw strike. With the Right to Education (RTE) Act coming in force today, the Directorate of Education, Delhi government, has issued a circular to all the school principals directing them to promote the students who had failed in classes VI, VII and VIII, officials said. It is as much a reflection of the ground realities as an irony that the intended beneficiaries of the Right to Education law in the city have little idea about the "historic and revolutionary" step. On the eve of World Autism Day, here is an instance of duality in the so-called inclusive educational set-up of one of the Capital's famous private school even as the historic Right to Education Act, 2009 comes into effect today in the country. The Delhi Jal Board (DJB) while giving final nod to its Rs 1,624.37 crore budget for 2010-11 financial year in its 98th meeting today warned strict action against water thieves. An all-woman car rally having 60 women behind the wheels was flagged off from the Capital today to spread awareness about the growing menace of breast cancer amongst Indian women. A senior teacher at Atma Ram Sanatan Dharma (ARSD) College of Delhi University (DU) today claimed that he had exposed a case of bungling in grants received by the college for buying computers. The protest at Delhi Technological University seems to be hitting a dead end, with the students refusing to give in till their demands are met while at the same time the university and the Delhi government refusing to budge from their position. With timely action from three constables, the south district police succeeded in arresting two robbers merely an hour after they robbed a TSR (taxi scooter rickshaw) driver in the Vasant Kunj area. Two children were burnt to death in a fire that took place at jhuggis in the Jamia Nagar area of south-east Delhi this morning. Short-circuit in the electric wires is said to be the reason behind the incident. 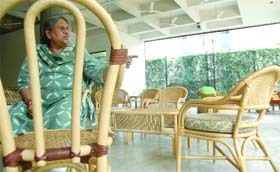 She has designed exotic cane furniture for the British Council, Trident Gurgaon, Trident Chennai, British Embassy in Egypt and Nepal and the Oberoi hotels and towers in Mumbai. A 31-year-old domestic help was allegedly beaten to death by her employer and his accomplices for allegedly stealing Rs 5 lakh in Bhajanpura today.The police said that the incident occurred around 11.30 pm in the Yamuna Vihar area of Bajanpura. After receiving clearance from the Commissioner for Metro Railway Safety (CMRS), R.K.Kardam, Delhi Metro Rail Corporation (DMRC) would inaugurate the Inderlok to Mundka standard gauge corridor tomorrow. Sumit Singh, a B.Tech student of Amity University, on Wednesday evening allegedly committed suicide by hanging himself from the fan in his room. According to Singh’s cousins who lived with him, he ended his life due to tension and stress because of exams. Members of the Delhi Assembly today objected to liquor being served in Ambedkar Stadium, dance by cheer girls and chatting offer with them through SMS during the IPL match held yesterday. A family was allegedly held hostage in their house and robbed of cash and jewellery worth Rs 5 lakh. The incident took place this afternoon in the Gulabi Bagh area of north-west district. The All-India Students’ Association observed April 1 as ‘black day’ protesting against the operationalisation of the Right to Education Bill. Over a hundred students from JNU, Jamia and DU gathered at Jantar Mantar to decry the Act. Four persons died and one sustained grievous injuries as a speeding truck allegedly ran over them at the tri-junction of Meerut road under the City Kotwali area here. The report said that low-floor DTC buses were not only fit to drive on Delhi’s uneven roads but their maintenance cost is also quite high. The annual maintenance charge of these buses would be Rs 833.30 crore over the period of 12 years. The government had not given due consideration to the central institute of road transport (CIRT) that had pointed out various limitations of these buses. The report said that DTC was in loss of Rs 1708.55 crore last year. The corporation earned Rs 25.90 per kilometer and spent Rs 119.27 crore. Pointing out the discrepancy in Delhi Fire Service (DFS), the report said that DFS was not well equipped as there was shortage of different types of firefighting vehicles ranging from 13-67 per cent against the requirement. It also has less manpower. Eleven water tenders remained out of order. Out of 278 static water tanks, 164 were non-functional. The response time of the DFS was more than the prescribed limit of five minutes. The report also pointed out that Guru Teg Bahadur Hospital did not adhere to nine out of 12 minimum fire prevention and safety measures. Besides, 746 schools and 2377 highrise buildings do not have fire safety measures. As far Delhi Jal Board and MCD, they failed to spend their money to provide civic amenities. The MCD diverted an amount of Rs 24.40 crore as supervision and establishment charges whereas DJB diverted funds to the tune of Rs 2.40 crore in some other head. The auto drivers already agitated over the Chief Minister Sheila Dikshit’s statement to phase out autorickshaws in the city are also demanding increase in fares. Although the government has warned of action against those who decide to go ahead with strike, there seemed no signs of the strike being called off. “We would continue till our demands are met which include hike in fare, shelters and auto stands and the withdrawal of Chief Minister’s statement on providing alternative mode of transportation to autorickshaws,” said Laxmi Chand Kashyap, union leader of autorickshaw drivers. Dikshit had earlier said that the government will look at other options to give commuters a better transportation system. Around 55,000 autos remained off the roads affecting over 10,000 commuters in the Capital. People, especially office-goers struggled for hours to travel small distances throughout the day. Though, the strike hit daily earnings of the auto drivers, it was merry-making time for taxi drivers who took advantage of the situation and charged double to triple fares. One of such worst hit areas was railway station where passengers had no options than to hire taxis at unreasonably high charges. “We waited for auto for almost half an hour before we came to know about the strike. The taxi drivers are charging around Rs 500 for not more than ten kilometers,” said Ramesh Khanna. Ankit Yadav said he could not even get a radio taxi because of the huge demand for them. “After wasting one hour on the road looking for an auto, I booked a radio taxi which did not reach either,” he said. Even for those who generally take the bus, it was a challenge to board one because of overcrowding. “Almost all the buses were overloaded. It was a suffocating sight,” said Rashmi, a student. Since all the schools in Delhi had announced their results before the implementation of the RTE, which bars schools from failing any student till Class VIII, officials said the circular was required to inform them of the provision. The RTE makes it mandatory for every student to have education till middle class, said VP Singh, state project director of the Delhi government. The principals have also been directed to prepare a list of more teachers they want and prepare a road map for three years to make the scheme successful. There is a shortage of thousands of teachers in Delhi. The Act says that there should one teacher for every 30 students. In Delhi government schools, posts of 800 TGT, 1,109 PGT and 175 principals are vacant, sources said. The principals have been asked that if a student fails by just a few marks, he should be promoted. If he is indeed weak in some subject, he could be placed in the compartment category and given a chance to reappear in examination, sources said. As far developing infrastructure, the city government has submitted a proposal to the union ministry of human resource development. The decision is likely to be taken in July to sanction finance, the sources said. Be it the laborers at the Commonwealth sites, child labourers, rickshaw pullers or house maids, a majority of them that The Tribune spoke to were ignorant about the law. Many of them showed no speck of enthusiasm when said their children would get free education till Class VIII. Chhotu, 12-years-old who works at a Paranthewaala Dhaba near Moolchand, quit school after Class II to supplement his family income. "I would love to go to school again but I cannot quit working. My mother needs money," he said nonchalantly. Krishna, 7-year-old, has more complex problems. She performs acrobatics at one of the South Extension traffic lights and hopes to earn some money from the amused commuters. Her mother would never allow her or her brother to go to school. "Ma has a broken leg and drinks 'daaru'(alcohol) every day. Once my grandmother tried enrolling me in school, but ma fought with her," said Krishna also admitting that she loves to draw. Madhumita, secretary, Child Development society, says that the problem is rooted deeply. "For a starving family, education is the last thing on their minds. Their priority is food, forget even shelter. For making ends meet, all the family members work. In dire cases, the state has a very important role to play. Thorough checking mechanisms and action against parents such as Krishna's is essential." Malti, who works in Greater Kailash as a maid in four kothis, has four children. Though her 10-year-old son goes to school regularly, Malti is unwilling to send her daughters to school. "My youngest girl is still eight months old. One sister is required to look after her, and the other one who is seven 7 old, helps me in my work in the kothis. I cannot afford to send them to school." When told about RTE, she said, "I have never heard of such a thing. Even if it is good, my husband would not allow it." While the major problem is the attitude of the parents, there are some who are unsatisfied with the quality of education in government schools. "We have heard of such programmes in the past as well. We had some "babujis" coming to the jhuggis who asked us to enrol our children in municipality schools. But within months, the teachers stopped coming. They demanded fee for private tuitions," said Bhulia, a rickshaw puller who lives in the RK Puram jhuggi area. "If this rule comes into being, I would want to send my boys to school. But what guarantee is that the same will not happen again?" he added. On March 15, seven-year-old Rishiraj Nath, who suffers from joint attention deficiency-kind of neurological abnormality under the autism spectrum disorder-was allegedly denied promotion to standard I by Santa Maria School in Vasant Kunj on grounds of behavioural problems. The school is the junior section of St Mary's School at Safdarjung Enclave, which interestingly has several awards to its credit for promoting inclusive education for children with special requirements. A central government employee, Rishiraj's father, said that after August 2009, when Rishiraj was promoted to the preparatory class from kindergarten, the school authorities intimated them verbally that they need to look for other schools for their child. "When we got several calls from the school to withdraw our child from the school, we requested the management to allow my wife, who is a special educator herself to sit with him for assisting in his lessons in the class, but the school refused our proposal. Instead, we were told that our child could not be promoted to the higher class," said Rishiraj's father, who initially thought that the school was possibly trying to cite its own incapability to handle our son. When asked the reason, the principal said "your child cries" and it would be better for the child if he goes to some other school. We asked them to give it in writing and the letter given to us on February 8 read, "Under no circumstances, the child could be promoted and allowed to continue in the same class as he has behavioural problems." Nandita, Rishiraj's mother, said, "The principal gave us the final assessment report and told that it is due to our attitudinal problem that our son cannot be promoted." However, this did not let down the spirits of Rishiraj, who thereafter applied to several schools and currently, is admitted to standard I of Cambridge Primary School in New Defence Colony and the school has permitted Rishiraj's mother to accompany him to the class. Residing in Sarita Vihar in Delhi, the family said that it would approach the CBSE, the social justice ministry and the human resource development ministry soon to ensure that such discrimination doesn't foil the very purpose of the education act. "Schools like St Santa Maria, which pick up children and then remove as per their convenience, are educated about the cause. It is very important that parents should come forward and voice their opinion," said Rishiraj's father. Full household survey to trace missing consumers will be conducted. Besides, a scheme that would fetch legal water connection to unregistered households will be started. The Jal Board has also proposed to constitute three courts under special magistrate to take action in cases of illegal water and sewer connections, water theft, non-payment and arrears. Rs 905 crore has been earmarked for water sector, including Rs 70 crore for MLA priority works, Rs 0.55 crore for rain water harvesting, Rs 9 crore for JJ clusters and Rs 133 crore for water supply in unauthorised colonies. While Rs 595 crore has been allocated to sewerage sector, the central share of YAP-II has received Rs 124.47 crore. DJB CEO Ramesh Negi said that the civic body would provide clean water supply and sewerage services across the city. “The Jal Board has tried to cover the rising number of migratory population by increasing the water supply and strengthening sewerage services,” he added. In the water sector, the budget will focus on additional arrangements to procure raw water, completing Munak Canal, extension of water network to 200 unauthorised colonies, starting the Bawana water treatment plant, commissioning of 15 additional reservoirs, checking water leakages, installation of pressure and quality meters, replacement of old water mains, strengthening transmission network, full domestic metering, establishing Dwarka and Okhla plants, implementing SCADA system and enhancing overall consumer convenience. “In the sewerage sector, focus would be laid on interceptor sewer project, completion of two sewerage treatment plants (STPs) at Okhla and Kondli, replacement of corroded or under-sized branch sewers, completing all Yamuna Action Plan-II projects, rehabilitation of all major trunk sewers for optimum capacity utilisation of all STPs, minimum overflows into the Yamuna and expansion of sewer network to unsewered areas,” said a senior DJB official. Entailing an investment of Rs 450 crore, the DJB is constructing a 102 km-channel from Munak to Haiderpur with the help of Haryana government. The project which is expected to be completed by June 2010 will save 80 MGD of water losses. This will enable Delhi to operationalise water treatment plants at Bawana (20 MGD), Dwarka (50 MGD) and Okhla (20 MGD). The Bawana water treatment plant is likely to be commissioned this financial year. On the initiative of the NGO, Breast Cancer Protection, these women participants will also carry the message of “save the tiger” as they pass through the Sariska National Park in Rajasthan where for the first time the tigers went extinct. The chairperson of the organization, Dr Ramesh Sarin said breast cancer was one of the major dangers facing the Indian women as their lifestyle is changing. “Indian women are now making their independent choices like their counterparts in the West and traditional ways of protection from breast cancer are not being followed,” said Dr Sarin. She said early detection is the best way to save oneself from breast cancer. “All women who have crossed 40 years of age must go for regular mammogram tests,” said Dr Sarin. Another key person behind the organization, Dr C.S.Pant said almost 60 per cent women come to the doctors when they have already crossed the III stage of breast cancer. “Breast cancer could be completely treated in the first stage and patient could live a normal life, but women should be able to detect it in the early stages and hence we are advocating for self-examination,” said Dr Pant. 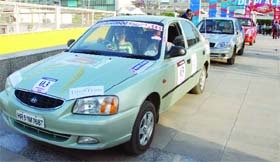 This is the second Women’s Car Rally organised by the NGO. Another family that came out to support the cause were Nirmal Singh and her husband Col. Harshwardhan. “We have driven around from one state to another because of my husband’s transfer so I am confident about driving,” said Nirmal. In the three days, the car rally would pass through Sariska and would culminate in Jaipur on April 3. The alleged bungling was exposed after Dr Vijender Sharma of the physics department of ARSD College moved an RTI application, asking how the grant of Rs 7.5 lakh meant for the purchase of computers in 2009 was spent. The reply given to him revealed that all the paper work that took place for the purchase of computers was prepared in back dates. While the order for desktop computers was given to Hewlett-Packard, the company never delivered the computers, said Sharma. According to the RTI reply, a bill was prepared on April 27, but the principal’s signature carried the date of March 18. Sharma said the college never received any price quotation from HP nor did it ever place any order. Under the eleventh plan, DU had received Rs 214 crore from the UGC. Out of this, around Rs 10 crore were given to different colleges for improvement of computer facilities. According to reports, some teachers bought personal laptops from the money given to the college for computers. “It is clear that a high-level bungling has taken place in connivance with the then principal Kavita Bhatia,” alleged Sharma, while speaking to The Tribune. Bhatia could not be reached for comments. Dr Sharma, who is also a former president of the Delhi Teachers’ Association (DUTA), today filed a complaint against Bhatia with the present principal of the college, Dr A.K. Rishi, DU vice- chancellor Dr Deepak Pental and the Union Grants Commission (UGC). Continuing with their agitation, students today protested vigorously outside the administrative block of the university. A delegation of the students also held a meeting with the new registrar of the institute, U.K. Vohra. Before this, the students had on Wednesday protested outside the vice-chancellor’s residence. The student said that none of their demands was accepted by the Delhi government or the university authorities. “We will continue our protest until vice-chancellor (VC) P.B. Sharma is asked to step down and the college’s original identity as Delhi College of Engineering (DCE) is restored,” he added. Unsatisfied with the developments, the students have now decided to intensify their agitation. They are planning to hold a hunger strike soon. “We want the VC to go. We have provided the government with enough evidence to support our allegations of his highhandedness and unfairness,” said another third year student. Meanwhile, the university on its part is trying to reach out to the parents of the students. On Saturday, the college will hold a meeting with the parents. The meet will be attended by the members of the university’s board of management. The students of DTU have been protesting for more than a month now. Their main demands are that Delhi Technological University should revert to its original status of Delhi College of Engineering and the vice-chancellor should step down from his post. For this, the students have held several rounds of meetings with both the Delhi government as well as the university authorities, but in vain. — Pramod and Rajesh— not only robbed items, including mobile phone, Rs 750 in cash and the driving licence of the victim, were recovered, but another TSR driver was also saved from becoming their victim. The incident took place on the intervening night of March 29 and 30 when constables, Jasbir, Amit and Manish, were performing night patrolling duty at Mahipalpur Road. 3 am, a TSR driver, Manoj, told them that four persons, who had hired his TSR for Chattarpur, robbed him near Vasant Kunj flyover. “Hearing this, the three constables without wasting any time rushed towards the direction where the criminals had reportedly gone. They soon found the four accused. The constables signaled them to stop. Seeing them, all the four criminals got out of the TSR and tried to flee. But the constables chased them and succeeded in nabbing two of them,” said the officer, adding that the other two managed to escape. Fire officials said that they received a call about the incident at a Dhobi Ghat jhuggi near Batla House around 6:40 am. "Four fire trucks were rushed to the spot. The situation was easily brought under control. But two children were trapped in a hut. By the time the flames were doused, they were already charred. Their charred body was found in the hut," said a fire official adding that the fire had spread to two adjoining huts too. The deceased children have been identified as Guddu (5) and Raja (3). The police said Guddu and Raja were sleeping alone in the hut when the incident took place. "The father of the children, Salim with his wife and two other kids had gone to the Yamuna bank to attend to the nature's call, leaving Guddu and Raja sleeping in the hut. While Salim with his wife and two kids was away, his hut caught fire killing Guddu and Raja," said a police official. When Salim returned he saw hit hut in flames. He and his wife tried to save Guddu and Raja but failed. In the process, the couple sustained injuries. "The couple was given medical," said the police. The police said that illegal electric connection to jhuggis caused the fire. "Most jhuggis in Dhobi Ghat are drawing power supply illegally from the electric pole. Salim's jhuggi too had an overhead wire coming from the pole. It was some short-circuit in these wires that led to the fire and the death of his kids," said official. This is the second incident of children being killed in fire. Earlier, two children were killed in a similar condition at a Shalimar Bagh jhuggi on Tuesday. And after a gap of 6 years, Manju Singh is back with her latest collection in an enthralling exhibition at the Chimaya Mission Centre in the Capital. Beginning tomorrow, the five-day exhibition showcases premier quality cane, wicker and rattan furniture from her manufacturing line, “Vetesa”. Speaking about her exhibition and her passion, Manju said that exhibition is themed around “preserving nature through design excellence”. One of the major highlights of the show will be the latest designs which use cane fabric as an upholstery material. A Columbia University alumna, Manju was married to Late Shailendra Kumar Singh, Governor of Arunachal Pradesh and Rajasthan till he died in office in December 2009. Vetesa’s furniture is 100% handmade and designed by Manju herself. For putting up this exhibition, it took her almost three years. Be it dealing with local wood dealers or block printing artists in Jaipur, Manju does it all on her own. From sofa sets, designer chests, planters, dustbins, dining table sets to comfortable recliner chairs and beds, Manju’s collection offers it all. She admitted that she would continue working and might even consider exhibiting outside the Capital. “The deceased has been identified as Rajkumari, who was a domestic help of the main accused, Devender. Rajkumari was allegedly beaten to death by Devender and his three accomplices for allegedly stealing Rs 5 lakh from his house,” said a police officer. The police said that Devender lived in the Yamuna Vihar area and owned a hardware shop in Bhajanpura along with his. “On Wednesday, Devender found that Rs 5 lakh were missing from his house. He and his brother, Surender, assumed that the money was stolen by Rajkumari. When Rajkumari reached Devender’s residence along with her daughter, Mamta (6), and son Sunny (5), Devender and his three accomplices held Rajkumari hostage at the second floor of his residence and beat her to death,” added the police officer. The police officer also said that the accused did not file any complaint regarding the alleged stealing. “Devender has been arrested, while Surender and two other accomplices fled the spot,” added the police officer. According to the police, the body has been sent for postmortem and a case has been registered. “One of the accused Devendra has been arrested while Surender and two more accused— Rohit and Ravi— are absconding,” added the officer. "Having received the safety clearances, India's first standard gauge Metro line will be ceremonially flagged off on Friday by minister of urban development S. Jaipal Reddy in the presence of Chief Minister Sheila Dikshit," said Anuj Dayal, spokesperson, DMRC. The 15.1-km line will be opened to the public from 6 am on April 3. This will be the fifth line of the network and has 14 stations: Inderlok, Ashok Park Main, Punjabi Bagh East, Shivaji Park, Madipur, Paschim Vihar East, Paschim Vihar West, Peera Garhi, Udyog Nagar, Surajmal Stadium, Nangloi, Nangloi railway station, Rajdhani Park and Mundka. Over one lakh commuters are expected to use it every day. Sumit Singh, a B.Tech student of Amity University, on Wednesday evening allegedly committed suicide by hanging himself from the fan in his room. According to Singh’s cousins who lived with him, he ended his life due to tension and stress because of exams. However, the police is not satisfied with the reason given by the cousins and is trying to find out the truth. Singh, 21, was a native of Sahib Ganj village in Ferozabad. He used to live with his cousins— Upender and Amit— in a rented accommodation (House no. D-52, Madhuban Vihar, Sector 82). Upender is Singh’s maternal uncle’s son, while Amit is the son of his paternal uncle. Singh was a third year student. Amit is an MBA student, while Upender is a B.Ed student at one Chet Ram College. Singh was to appear for his exams from April 12. According to Amit and Upender, when they left for their colleges on Wednesday morning, Sumit said that he would not go to college. When Upender returned in the evening, he found the door locked from inside. He knocked at the door several times, but there was no response. He then called up on Singh’s cell phone, but there too he got no response. Upender then called Amit and the two broke opened the door and found Singh hanging from the ceiling fan. They called the Phase-II police, who brought down the body and sent it for postmortem. The police could not find any suicide note. The excise department will conduct an inquiry to find out how liquor was served outside the prescribed area. The issue was raised by Congress MLAs Subhash Chopra and Mukesh Sharma and LJP MLA Shoaib Iqbal. The MLAs have demanded ban over liquor and dance by cheer girls in stadium. Iqbal said that he wanted to see the IPL match yesterday but his son who was already inside the stadium advised him not to go as liquor was being served there and girls were dancing. The next match would be played on April 4. State minister A.K. Walia has assured that he himself would go to see the match that day. He said that if anything illegal was found, strict action would be taken against the authorities concerned. "Five persons barged into the house of one Harish Chand on pretext of reading the electric meter. After entering the house, the robbers held Chand's family hostage at gunpoint and decamped with cash and jewellery worth Rs 5 lakh," said a police official. 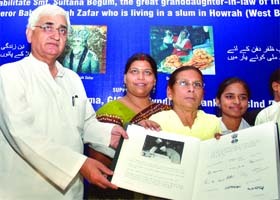 The official said Chand, his daughter-in-law Geeta and his grandson Mayank were present when the incident took place. "Two men identified themselves as employees of the electric department. They told me they wanted to take the meter reading. After entering my house, they allegedly held me hostage at gunpoint," said Harish Chand adding that in the mean time their three other accomplices also barged in the house and robbed us. Aslam, general secretary of the AISA Jamia unit, said, “The RTE in its present form is a farce in the name of providing genuine education. It makes only a hollow promise that 25% seats in private schools will be reserved for poor students and the government will supposedly contribute to paying their fees.” Aslam warned that the fee money provided by the government will not compensate for the exorbitant cost of education in private schools and this in turn will lead to big fee hikes. Meanwhile, the AISA also issued a warning against the foreign educational institution bill 2010 which has been cleared by Parliament. Students said the bill will have “dangerous implications” as it will pave the way for the unrestricted entry of foreign players in the education sector. Those dead have been identified as Mukesh of Ukhlarsi in Modi Nagar, Devender of Duhai village in Modinagar, Chattarpal of Nai Basti in Muradnagar and Rajkumar of Modi Nagar. Rajkumar’s father, Navdeshwar, was seriously injured.